IBM’s color-sensitive Supply Chain billboard won gold at the London International Awards this week. The sign adapts to people standing in front of it, changing color to match their outfit. 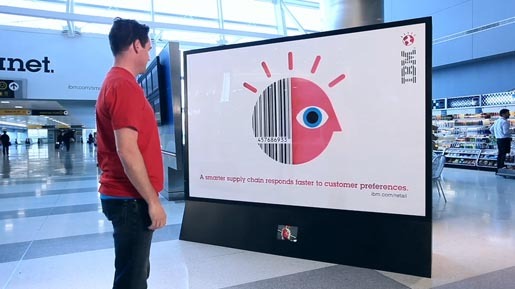 The billboard, part of the Smarter Planet campaign, was designed to demonstrate the ways in which consumer data such as color can have massive implications around shipping, inventory and overall sales. High-brightness architectural LED arrays were controlled by signals from live video signals. The simple message, “A smarter supply chain responds faster to customer preferences”, is linked with the IBM site, ibm.com/retail and the challenge, “Let’s build a smarter planet”. The Color Sensitive Board campaign was developed at Ogilvy, New York, by executive creative directors Tom Godici and Greg Ketchum, creative director Adam Lau, associate creative director/copywriter Jones Krahl, associate creative director/art director Milton Correa, illustrator The Office, digital artist Justin Bakse at The Studio for Interactive Media. Fabrication was done by Hard Decor.